Put the frozen banana in the blender cup, then the almond butter and anything else. Pour in a good amount of almond milk to almost fill the cup. Screw on the cap, stick the cup on the motor base, and blend for 30 seconds. Then take it off the base and give it a little shake to get anything that's stuck on the top of the cup. Blend for another 20 seconds or until the smoothie is churning freely from top to bottom. 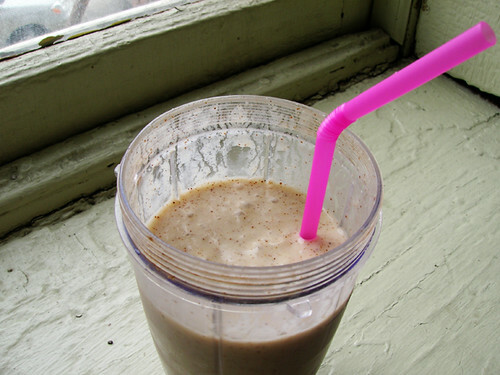 Just blend the banana and almond milk together, very light and refreshing.